It is rare that we get to compare both videotape and kinescope but MLB.com afforded us that luxury recently with a montage videotaped clip from the 1970 World Series. Well known as the 'Brooks Robinson Series', the video clip seen here offers a glimpse at what the 1970 World Series looked like in color on NBC. The series, as it exists to collectors, is in the form of Games 1 thru 4 in black and white kinescope and Game 5 in color videotape. After the jump, I'll show some side by side shots of the kine against the videotaped footage. Please Contact me if you have any materials, whether it be old NBC/CBS/ABC Game of the Week Schedules, video or film in your personal collection or any information about full game broadcasts. 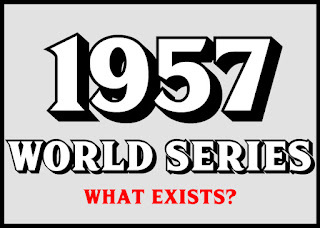 Which World Series set would you like to see released?